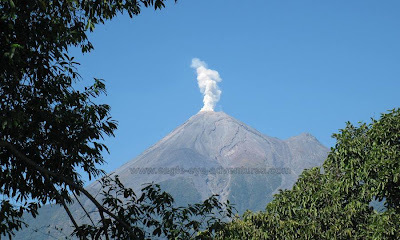 Fresh puffs from the Colima volcano drifting in the morning sky. The excitement of traveling and exploring isn't always dependent on finding a specific plant. Sometimes it is just a visceral feeling of awe from some facet of the natural world. Something that captures your mind and imagination even when it is what you planned and expected to see. 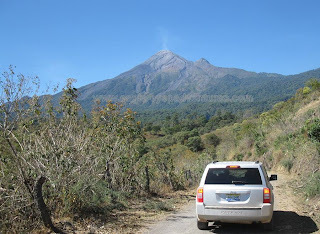 This happened to me when some friends and I wanted to explore the area around the Colima volcano in western Mexico. The volcano is split by the border of the states of Colima and Jalisco and overlooks the capital city Colima. The state of Colima is one of the smaller states and has a strong sense of identity with the volcano. 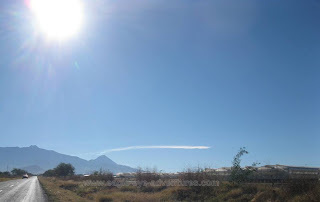 We drove in from the northern, Jalisco side and we were treated to some surprises. Throughout the long approach it kindly reminded us that it is indeed still an active volcano! It would intermittently send up puffs of steam and gas that would then drift across the sky. That only added to the excitement of exploring this new area. It is actually a fairly tall mountain and the types of bromeliads we were looking for faded out pretty quickly. But it was nice to see a few other interesting things, like an interesting miniature weeping bamboo. Even simply looking at these pictures again I feel that exciting sense of awe as we got closer and closer to this great volcano. The power of the natural world weighed heavy on my mind as we climbed up into the forest on the side of breathing volcano.